Yakimono in Japanese refers to a “fired thing.” A reverence for nature has historically been part of Japanese art since ancient times. Interestingly, the evocation of the respect for nature has been as strong in ceramics as it has in painting, calligraphy, sculpture, and architecture. There has traditionally been a strong spiritual element to Japanese ceramics because of their connection to Zen and tea. This is just as true today as it was centuries ago. We just added an image of this gorgeous work to our digital collection and, yes, it was a “Wow!” moment. This artist is awesome. The oldest art form to survive from Japan is ceramics. As in China, ceramic arts are an honored art form even above sculpture. Until the eighth century CE, the predominant ware in Japan was unglazed stoneware. Intentional high-fire glazing of stoneware did not occur until the Kamakura period. Japan did not successfully produce porcelain until the early seventeenth century. Up until that time the famous Chinese porcelains were highly prized by the imperial household and nobility. Ceramics production never reached the scale that it did in China. Japanese art encouraged the emergence of strong personalities and distinctly individual styles in ceramics. There is a tradition of celebrated artist-potters in Japan. The tea ceremony, popular from the Momoyama (1573–1615) through the early Edo periods, influenced a great period of ceramics activity. The tea ceremony had a preference for simple wares. Ceramics continue to be a significant art form in Japan. It is evident that strong personalities, such as Sugiura Yasuyoshi, still have significant influence in ceramic art in Japan. 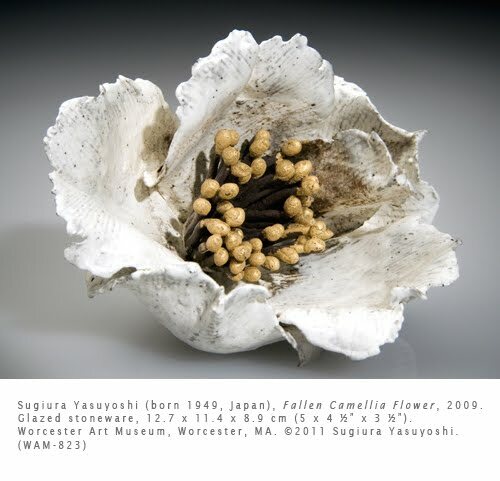 Yasuyoshi’s works definitely carry on the Japanese tradition of ceramics and the reverence for nature. The artist carries the significance further, in asserting that his flower pieces also emphasize the texture of the clay, another aspect of the respect for nature. Yasuyoshi’s work of the 1980s and 1990s was dominated by large installations of ceramic “megaliths” in series called Ceramic Stones and Ceramic Boulders. This camellia piece comes from a later series called Ceramics of the Natural World. Although we in the west would look at this as sculpture since it is non-utilitarian, the artist calls all of his forms “vessels.” He regrets that many ceramic artists in Japan need to produce utilitarian wares to make a living rather than persevere in ceramics as artists.